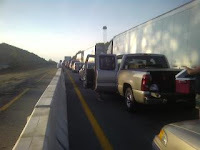 So, to compound the stress and craziness of moving, a traffic jam thought it would have a go at my patience. It certainly tried me! We sat for quite a while in this madness. As I was looking in my rearview once, the trucker behind me looked like he was having a good time by/with himself. A second later, he dumped a 36oz. guzzler from the gas station, filled with urine, out his window. In a way I was relieved to find out that's what it was but in another way, I was still grossed out. Moments after that, I looked back again and the old fart, probably 200+ lbs., was walking around the cabin of his truck in his blue undies. I was floored. At that point, I decided to stop using my mirrors! Fortunately, the fellow in front of me opened his tailgate, searched through a cooler, grabbed a Mountain Dew and then motioned to me, asking me if I wanted one. With sweat pouring off my forehead, I gladly obliged. I sat on the interstate guard-rail talking to him for a bit; however, he cursed more than he conversed, I believe. It's shaping up to be a crazy trip up north at this point, I wonder what lies ahead? I just hope I don't get stranded anywhere any time soon again.